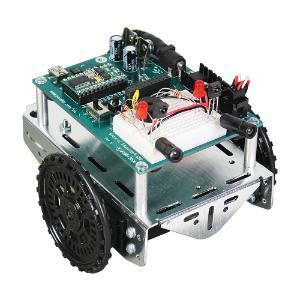 Build a rolling robot with a BASIC Stamp 2 microcontroller brain. 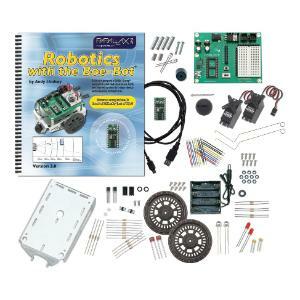 Just follow the clear, step-by-step instructions and illustrations with the included book, Robotics with the Boe-Bot. No programming or electronics experience is needed! The Boe-Bot Robot takes about 1-2 hours to put together. 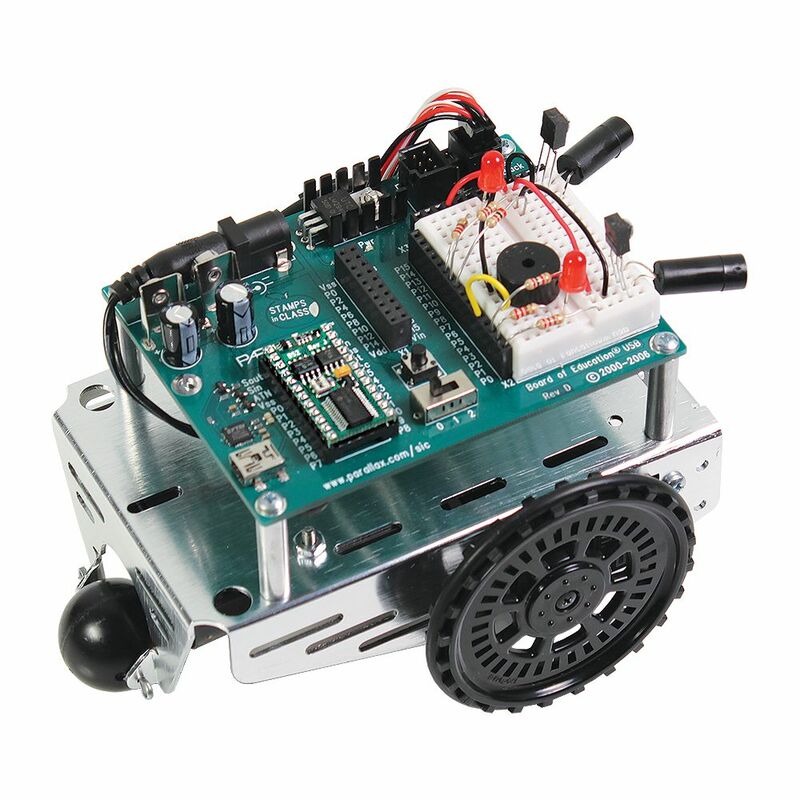 Each project in the Robotics text provides a unique new experience of wiring and source code tuning. Completing the entire set of projects takes 50 hours and is suitable for anybody over 13 years of age. The USB Board of Education (and BS2-IC) may also be removed to be used as a platform for other inventions and studying other subjects, such as physics with our wide variety of sensors. You can find Boe-Bot robots in middle and high schools, vocational schools and colleges, robotics clubs, and hobbyists’ homes. They are great companions for learning or teaching technology, mechatronics, and STEM programs. It's also an approved platform for the Boy Scouts of America Robotics Merit Badge. 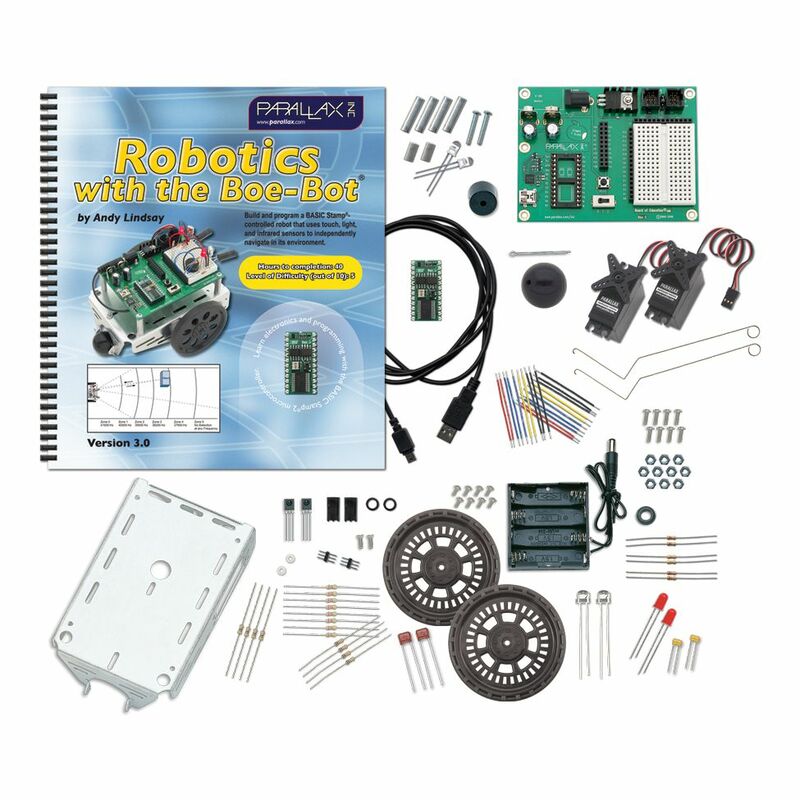 This robot kit can be used as a California A-G approved elective course. Assessment material is available to verified educators. Ordering information: Kit contents include Board of Education development board with a BASIC Stamp 2 microcontroller; Durable brushed-aluminum chassis with mounting holes for servos and accessories; Parallax continuous rotation servos for the drive wheels; Sensors including whisker-switches, phototransistors, and infrared emitter/receiver pairs; LEDs and a piezospeaker for audio and visual feedback; All the resistors, capacitors, and jumper wires needed to build the circuits; All the screws, nuts, and other hardware needed to build the Boe-Bot; Parallax #1 Phillips/flathead screwdriver; and USB A to Mini-B cable to connect the Boe-Bot to your Windows, Mac, Linux, or Chromebook computer for programming. Note: Requires 4 AA batteries, not included, and a PC running Windows XP/Vista/7. Recommended for ages 13 and up.